This 122-room hotel is a cherished Nashville landmark. Opening on September 17 1910, it was named after Andrew Jackson’s Hermitage estate having been commissioned by 250 city residents two years previously. 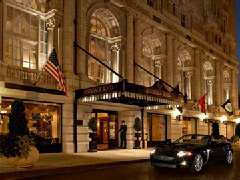 The Hermitage today boasts over 120 guest rooms and is one of the most highly rated hotels in the city. There’s a distinctly political feel to the list of famous former patrons: William Howard Taft visited on November 9, 1911; Woodrow Wilson in 1912; and both President Roosevelt and the First Lady stayed in 1934. Other notable names connected to the Hermitage Hotel include Al Capone, Greta Garbo, and Bette Davis.